I have a question about my cat's teeth. Or should I say lack of teeth. 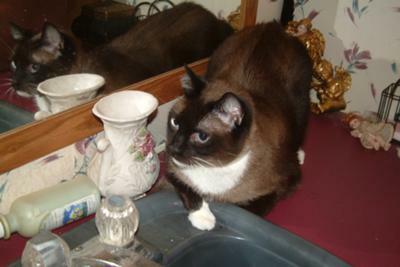 "Tooth" is a beautiful Snowshoe mix I rescued on Friday from the GCAC in Greenville, SC. He was given this name because he only has one tooth. The shelter employees know nothing about what happened to his teeth as he was turned in as a stray. I hadn't planned on rescuing Tooth. I'm getting a cat named Elisa on Wednesday. I really think the rescue worker's saw me coming on this cat and named her after me. After all, I can't allow a cat named after me to be euthanized. Elisa will be going for spaying and tooth removal on Monday. She was hit by a car and for awhile it was thought her jaw was broken. Turns out she only needs an extraction. A chip-in was raised to cover the cost and the cat ladies raising the funds for Elisa's surgery asked me if I'd also rescue Tooth. It was fortunate I was working only twelve miles from the shelter on Friday. I didn't want to leave him there until Wednesday as the longer the shelter confinement the more likely a cat is to get a URI. So I battled Greenville rush hour traffic to rescue him. I must confess I was expecting an emaciated cat. Was I ever surprised! 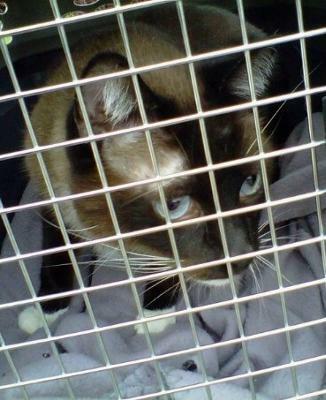 The article photo shows my new baby in the cat carrier I use for most of my rescues. The first thing I noticed as I left the building with him was it was VERY hard for me to carry him due to the weight. Tooth relaxed in the carrier for the entire trip home. We meowed back and forth at each other as he was on the seat beside me. I believe he enjoyed the ride. I had an equally hard time carrying the cage up the steps and into my home. As soon as I opened the cage door I saw what my "problem" was. 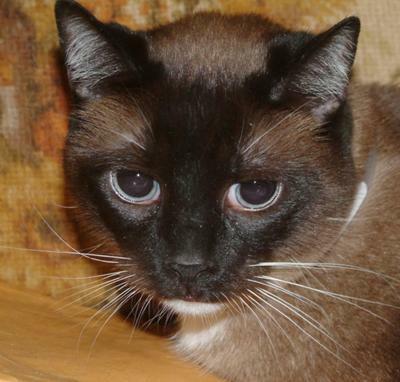 This chocolate Snowshoe mix cat is as large as a bobcat! I'm not kidding readers. He's at LEAST twenty pounds! I decided to change his name to Cocoa. Tooth isn't a very pretty name for such a beautiful cat. Since he's a chocolate cat, Cocoa is perfect. Laura brushed him Friday night and again on Saturday morning. I did my cat sniffing thing and my cat telepathy thing and he told me his people turned him in for shedding too much and also because a toothless cat is an ugly cat. Readers, what do you think happened with his teeth? I read cats can lose teeth due to gum disease if the teeth aren't cared for. He's around four years old. Although I don't know how that was determined since I thought teeth help in determining a cats age. And how could his teeth be in such bad shape and him appear so large and healthy. Cocoa laid on my bed for about an hour last night. I hope I can find him a good family. He's a very loving boy. I do have a chip-in at this link and hope to get some donations for canned food. I'll also try him on moistened dry food to see which he likes better. I eat fairly well without my false teeth and he may have tough gums if the teeth have been gone awhile. I want him to have what he likes best as I plan to spoil him during his recovery period. I'm at work today and Cocoa is spending the afternoon camped out in my closet. I'm flattered he and Samantha have chosen my bathroom as their shelter recovery area. My daughter Laura usually has the pleasure. I'd appreciate any theories on the tooth loss as well as any advice you can give me. I've never had a toothless cat before. Now I'm dealing with Cocoa and next week will deal with a post tooth removal cat that I want to put through as little trauma as possible. one of our rescues we named Panchita when she adopted my husband Frank (Panchita is the female nickname for Frank)she was about 4 yrs older than we tought & when she was 18 she lost most of her teeth but that didn't change her personality. She truly adored Frank & loved to hunt. A moody Tortie. A friend called her Nimrod (a mighty hunter from the Bible)Panchita passed away 12/2003 to our surprise her vet said she was @ least 24 yrs, how could he tell, her bones were so arthritic it that reminded him of a 97 yrs old human. Tooth will be your close/grateful companion for many years. Elisa you did a great deed for Tooth. As usual my best to you & purry friends. You are definitely an Angel on Earth. May the Lord truely bless you for all that you do for His kitties. You and all the kitties are in my thougths and prayers. A wonderful lady once told her daughter,"You will have many jewels in your Crown." It also applies to you. It's horrible that someone had Cocoa declawed, but if you think about it, anyone who spent money on having her declawed would likely also keep up with her vet work. If the teeth were removed, it would likely have been by a vet due to necessity. My cat needed all her teeth (with the exception of the top 2 canine teeth) removed due to congenital lesions. Perhaps it was a similar issue? The other thing I can think of is that maybe it was a rare defect where the kitty was born without most of her teeth. My cat adapted VERY quickly when it came to eating, so she is still slightly overweight and never let the loss of her teeth stop her from "gumming" even the crunchiest food and getting her fill. Cocoa picked you, and you are meant to be for him. You are a writer and a disseminater of information. This could be a good opportunity for you to learn these new issues and give them publicity. It's a learning opportunity and also an opportunity to educate disconnected people on who cats are, to leave them intact, and to discern if they should be cat keepers or not. You might try to get into more mainstream media outlets to bring this info to the forefront. I applaud you rescuing kitties! I wish I could, my cat is HATEFUL to other cats. 🙁 I tell him he is not very nice since HE is rescued! Declawed on all 4 paws,detoothed and then abandoned suggests to me that the person responsible is pure evil as is the doctor who mutilated the cat. I rescued a cat last year that had been declawed on all 4 paws who then also developed stomatitis. Research I did all pointed to pulling the teeth out as the solution. 🙁 However, there is probably so much more to the story of what is really going on with these cats. Wonder if the declaw has any connection? So maybe your guy had his teeth pulled because of stomatitis? IMO, speculation is a colossal waste of time. 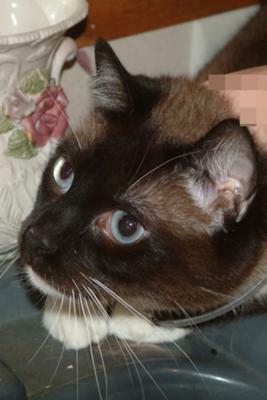 The FACT that Cocoa is declawed and almost without teeth is regrettable -- the former is criminal, and the latter is not going to be a problem, as many cats can and do live healthy lives after losing their teeth, for whatever reason. He should definitely see a doctor for a responsible and controlled weight-loss diet plan (preferably not involving science diet or other junky foods...)and yes, he will be a special cat for a special home, but there WILL be one for him. Sending him love, prayers, and purrs! He is GORGEOUS. btw, I'm one of the fb crossposters who networked him and has been "in his corner" from the start. Thank you for rescuing him!!! OMG! I just saw that the kitty was declawed on all 4 paws? I start to think that they took his teeth too. They took claws & teeth away to make the cat totally helpless. Horrific. The owner and the vet belong in jail. This poor cat endured so much pain. I can't even imagine who this cat was treated by the owner ... maybe the best was to bring the cat to the shelter. Now kitty will be (with your help) finding the best loving and gentle home ever. I can imagine that the owner abused terribly the cat and the cat was totally defenseless. OMG! Please, where do you live? What city? I like to help to find a good home for this kitty boy. Please be very - very careful that this kitty doesn't end up in wrong hands again. It could be that the cat has stromatitis (gum disease) and the previous owner removed all his teeth. However, if that would be the case, your cat would probably have somewhere in the mouth scaring from the surgery. Or does the cat have red gum or the back of the throat red? If not, my next guess is something more cruel/crazy related. The cat is declawed, many cats develop behavior problems when declawed and they start biting. Maybe the previous owner was crzy/cruel enough to extract all teeth from the cat? A toothless cat's bite doesn't hurt as much. Any indication of surgery like scaring visible? How is the cat doing? Is this a friendly cat or is he hiding? Is he hissing? If a person is cruel and ignorant enough to declaw a cat, they sure would be crazy enough to pull out all teeth, not considering the pain the cat is going through. This cat is 4 years old and endured already the worst pain in life. I hope you will find a very loving and gentle home for this cat, a quiet home because you don't want the cat to be scared. The cat would be probably best alone or with some other gentle and friendly cat. What monster did this ! It would be exceptional for a 4 year old cat to lose all his teeth. Having only one left seems to me as if some evil butcher masquerading as a vet detoothed him but missed that one. Especially as he's 4 paw declawed also. Obviously the monster who did the surgery hates cats and loves money and pleasing cruel people who shouldn't be allowed with a hundred miles of any cat. Michael I hate people who do this to cats too, with all my heart and I wish them the worst luck in the world and that they then go to hell for eternity. This is the horror that all cat lovers dread to see if Cocoa was detoothed and declawed. This would be madness. It is exceptionally rare (I hope) to remove all the defenses of a cat to suit the human. I hate the people who would do this. It appears that not only was he detoothed and declawed on all four paws he was abandoned as well. I just checked and he IS declawed. I think on all 4 paws! Oh God, no teeth and no claws! Never seen anything like it. He's bigger than Darla. He's at least as big as Jethro and Miss Kitty, who are my largest cats. He fits right in with my misfit cats. Shirley was helping him wash up earlier. I'm just glad he's not toothless AND declawed. And Dreyfuss LOVES him. This is the first full grown cat Dreyfuss has taken a liking to. Most were kittens and he grew used to them as they grew. I'll write on Elisa next week. She reminds me of Sheela with a tad more orange in her coat. The condition of teeth may guide us in judging the age of a cat but clearly it can be deceiving because at four years of age he should have pretty healthy teeth. I wrote an article about a cat losing teeth some time back. I might have been a bit harsh but I said that cat caretakers should be aware of gum disease and take preventative action so a cat losing teeth would indicate careless management by Cocoa's previous caretaker. Acute gum disease is the classic way cats and people lose teeth. But I may be completely wrong because to lose all the teeth bar one is strange. There can only be two explanations I would have thought, (1) he has a propensity to gum disease and his previous caretakers failed to ensure that his gums were kept in good condition and his teeth simply feel out or were pulled out by a vet (but why leave one in?) or (2) they were pulled out for no good reason. Is this a case of detoothing as in declawing?